Trying to figure out what the right oils are for your face, hair, and body can be quite the challenge. So, we’re here to make life a little easier on you. After reading customer feedback from guys who tried out different shaving gels, cream, and pre-shave oils, we decided to try out the top-sellers for yourself. Shaving unwanted facial, head or body hair without the right pre-shave oils can be a daunting experience. Choosing from the different options on the market today is no easy task either. The best pre-shave oil will go a long way in making your shaving process better. After all, if you truly want a close shave, you shouldn’t start out by lathering up with your go-to shaving cream. Instead, invest in good pre-shave oil and start with that before the razor blades reach your skin. Not only will this help to open your pores and soften the hair but it will help prevent skin irritation too. This is something you will need in your shaving kit, so choose carefully when making your selection. In this post, we’ll take a look at some of the best products on the market, give you some pre-shave oil grooming tips, instructions on how to apply pre-shave oil, and explain why the right pre-shave oil is different from other shaving lubricants. Below are the top rated products reviewed to make your search simpler. Not to be confused with beard oil, a pre-shave oil lubricates, softens, and lifts beard hairs away from the skin. They allow the razor to glide smoothly over your facial hair without you getting nicks or cuts. Most leading pre-shave oils are made from a mix of natural ingredients and will not clog your pores. What is the Use of Pre-Shave Oil? 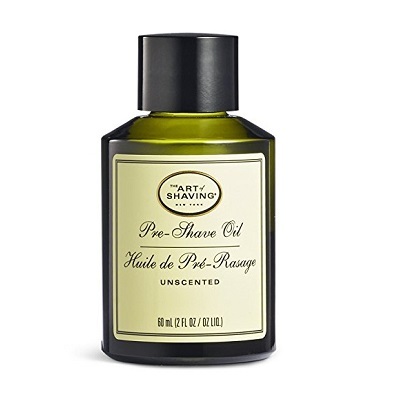 For those seeking the closest shave possible, you should know that many men swear by pre-shave oils. If you haven’t tried a pre-shave oil before, the purpose of using one is to soften your facial hair before you groom for a clean, smooth shave. If you have sensitive skin or skin that is prone to irritation after shaving, pre-shave oil helps to soften up your beard so the razor you use can easily cut through your facial hairs. The one downside of using pre-shave oils is that they tend to clog up your razor pretty quickly. So, make sure to rinse off your blade much more than you normally would. However, this is only a minor issue when compared to the quality you get with these oils. Since there are so many brands to choose from on the market, we made a list of our favorite style to make life a little more simple for you. You might be wondering ‘what exactly is in pre-shave oils?’ We are happy to say that the ingredients are mostly (if not all) natural. Generally speaking, these products are made from a mix of olive oil, castor oil, grapeseed oil, coconut oil, and more. Vitamin E is another common ingredient that helps to reduce skin irritation and inflammation. When searching for the right shaving oil for your facial hair, first and foremost, look for ingredients that moisturize the skin. You want to achieve the right amount of slickness so the razor will glide along your face. We advise you to choose a shaving oil that is all natural or hypoallergenic and won’t harm your skin. Are you interested in knowing our favorite ingredients? We love lavender oil, sunflower oil, castor oil, and olive oil. As one of the most popular essential oils, lavender oil is a soothing natural ingredient that not only calms your skin but reduces the chances of you getting razor burn. That is something we can all appreciate. Sunflower oil is another light ingredient commonly found in beard oil. We love it because it doesn’t clog your skin or leave your skin feeling greasy. Using sunflower oil gently moisturizes your skin and hair, leaving you feeling rejuvenated and refreshed instead of weighed down. For those of you who are prone to dry hair and skin, castor oil and olive oil are just what you need. These ingredients are common in beard oil made for those with coarse, dry facial hair. They also help to moisturize the skin and reduce irritation. In contrast to lavender oil and sunflower oil, castor oil and olive oil feel heavy. They cling to your face and hair, leaving a slick lubricated surface for your razor blade to glide over. If you can’t find the right products in the store, feel free to contact us for your skincare questions and product recommendations. When you are choosing facial products, you need to know your skin type. Don’t worry, this isn’t as overwhelming as it sounds. In fact, it’s quite simple. For example, if your skin is rough and your facial hair is course, opt for thicker oil. This product will penetrate the skin cells and follicles of your hair. The result is a softer overall shaving experience for you. On the other hand, if you’re skin breaks out frequently or your facial hair is fine, you will want to use a lighter oil. This type of product will not clog your pores. If you have sensitive skin, read the labels carefully and select only products with natural ingredients. Harsh chemicals are never desirable to treat the skin but if you have sensitive skin, you have to be extra cautious. While this may sound odd, the packaging of a product is a lot more important than you might think. Why? Think about the ease of application. Is this the kind of bottle where the handle could easily break? No one wants to be scooping out shaving oil with their hands. You should be able to eventually dispose of the container knowing that you got the most out of the product and there’s nothing left inside to use. Many containers are made in such a way that when you toss the bottle, there is plenty of product left inside and it is wasteful. Furthermore, you should also consider the impact the waste has on the environment. What type of material is the container made out of? Is it recyclable and biodegradable? Glass bottles are ideal because they can be reused and they block sun rays that decrease your shaving oil shelf life. It’s a win-win situation. We wish skincare products weren’t expensive but that is not always the case. While you want to invest in a quality product, it’s not necessary to break the bank. For those looking for high-end, luxury products, you can find it. On the other hand, if you are looking to sacrifice luxury, saving a few bucks is an option too. Most men opt for a middle of the road option. These products contain high-quality oils but skip out on the necessary frills that make pre-shave oil cost a bit more. You can purchase oils between $12 – $20. You will typically get a few ounces of the product. How much of the product are you getting? Check the number of fluid ounces listed on the bottle. You don’t want to pay a lot of money for the bottle’s weight. Most men’s pre-shave products come in 2 to 4-ounce containers. This might not sound like a lot but a little bit of these products go a long way. You will only need a few drops per use. Nothing is worse than buying a new product you’re excited about and realizing that you hate the smell. Before you invest in a new type of men’s grooming cream or pre-shave oil, make sure you read up on reviews and test it out if you can. After all, this scent could linger on your skin for a while. We’ve got good news for you. There are plenty of scent-free oils on the market if you don’t like wearing a fragrance. Alright, now that you know about the things to consider when buying pre-shave oil for men, it’s time to talk about your daily regimen steps. After all, shaving isn’t as simple as taking a razor to your face. For a smooth shave, try wet shaving. Here are the daily steps you should take to make your grooming an easy experience. Before you even apply your pre-shave oil, hop in a hot shower for a couple of minutes. The steam from the heat will open up your pores and allow your skin to soften and make the most of your products. Furthermore, open follicles allow a razor to pass through your hair more easily and achieve a clean cut. This means there will be less pulling on the root of your hair and less dry skin and irritation afterward. After you are done showering, pat your face dry with a clean towel and apply a few drops of pre-shave oil with your hands or a shaving brush (the latter will save you from a mess). Trust us, that is all you need. Applying shaving oil is easy. Place three to five drops of oil onto the palms of your hands, rub your hands together, and spread the oil evenly across your skin. After you have put the pre-shave oil on, it’s time to apply a thick layer of shaving cream with a shaving brush. Using a shaving brush is not only a handy way to keep your hands from getting sticky but they also do an excellent job of exfoliating your skin. Beyond that, they also cause your hair follicles to stand up straight. As we previously mentioned, this makes it easier for the razor blades to pass through and achieve a close shave. After you’ve applied the shaving cream, it’s time to trim your facial hair. 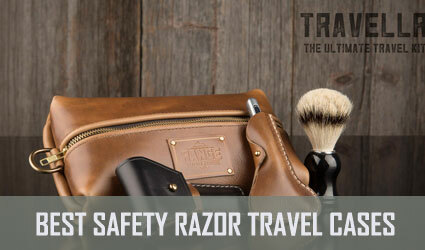 We highly recommend using a razor with a safety guard to protect your skin. After you have completed your shave, use a washcloth, soap, and warm water to remove any stray hairs on your face. Apply a few drops of a soothing post shave balm and you are good to go. What Ingredients Does a Good Pre-Shave Oil Have? Earlier, we briefly mentioned the common ingredients in pre-shave oil. However, it is worth expanding on. Understanding the ingredients of pre-shave oil helps you to understand its benefits. Carrier oils, essential oils, and vitamin oils are all part of good pre-shave oil. Carrier oils typically comprise about 90% of the overall solution. If you didn’t already know, carrier oils come from seeds and trees.  They are used in a wide variety of men’s and women’s skincare products in the global market. Even if you didn’t realize it before, chances are you have already seen some of these ingredients listed in your favorite products. Common carrier oils include argan, jojoba, coconut oil, castor, grapeseed, and sweet almond. These types of carrier oils are often used in hand soaps, shampoo, lotion, spray on hair conditioner, and other health and wellness products. Let’s go back to castor oil for a second. This is one of our favorite ingredients in pre-shave oils. Why? Castor oil is derived from the castor plant and brings a myriad of benefits to your shaving experience. This magic oil is a favorite shave secret. It reduces skin inflammation, reduced hyperpigmentation, fades blemishes, scars, and stretch marks, and helps to fight aging. We just can’t praise it enough. 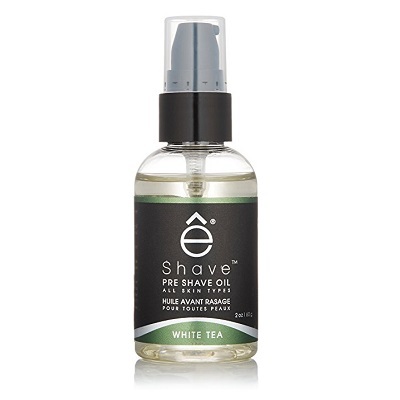 The second most common ingredient in pre-shave oil is an essential oil. You’re familiar with these. Peppermint oil is commonly used to help fight the common cold and lavender is used for its calming effects. Often coming in several varieties, essential oils bring wonderful fragrances to your products and deliver a great number of benefits. What do they do? For starters, they help fight signs of aging by smoothing the skin, tone skin spots and fade scars, and act as a natural antiseptic. Last but certainly not least, are vitamin oils. For those who want to moisturize, select pre-shave products packed with vitamin oils. Besides making your skin look great, they help to provide good blood circulation and moisturize your skin. When you are looking to pick up your next pre-shave oil, we highly recommend purchasing one with a high percentage of vitamin oils in it. What is a shaving brush and why do you need one? A good shaving brush is all about the application. 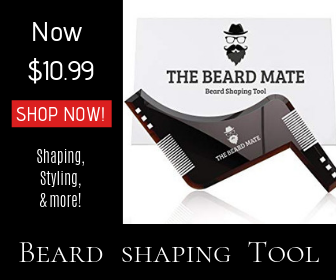 You will use this tool to apply products such as your pre-shave oil and shaving cream. Using a brush to apply your products is beneficial for a few reasons. First, it saves you from a mess. No one wants to constantly have to wash their hands and feel sticky from applying a grooming product. Second, when you use a shaving brush to apply oil or cream, the product goes on more evenly and you don’t run the risk of missing a spot on your skin. Your razor will glide over your face smoothly and you won’t get nicks and cuts. Finally, you will save a lot of product and extend the life of your pre-shave oil. Think about how much product you waste when you pour it out on your hands. Using a brush will save you from unnecessary expenditures. Do you have a post-shave routine? If not, it’s time to start planning one now. One of the most frequent complaints we hear from men and women alike is that they hate shaving. We get it. It takes a lot of time to prep with pre-shave oil, lather up, shave, and perfect your post shave routine. However, putting in the time to take care of your appearance and skin is always worthwhile. You will feel so good afterward. Most of us rush our grooming routine to get out to work in the morning. If you’re guilty of this, it’s likely your skin is neglected. 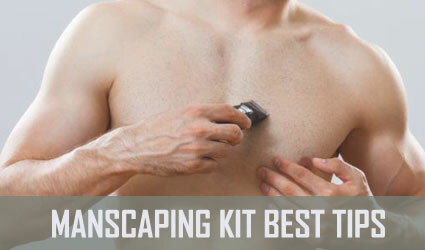 One of the fastest routines is to rinse, apply a quick dab of lotion, and take the blade to your stubble. But shaving isn’t that simple. Taking care of your skin after your grooming session is just as important as the prep beforehand. Sandalwood scent and lavender-based products are great for the skin. After you shave, you want to apply lotion or light beard oil to moisturize your skin and keep your facial hair healthy. 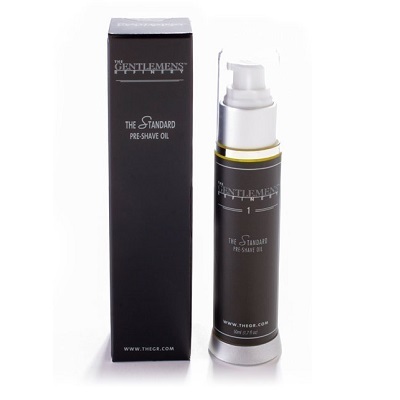 ‘The Standard’ pre-shave oil consists of sunflower seed oil, lime oil, jojoba oil, vitamin E, and roman chamomile. These ingredients render the product entirely organic and natural. It is suited for men with sensitive skin. The oil is easy to apply, smells great and rinses off perfectly. It can last you several months as you need just a small pump per use. The great news is it does not pile up between the blades and, thus, protects the shaver from possible injuries. As much as the price tag may not be attractive, the oil is well worth it for shaving at any level. The composition of a product is a major factor to keep in mind when looking to buy the best pre-shave oil. Within this product are oils such as cottonseed oil, sweet almond oil, grape seed oil, and castor oil. It also contains un-natural ingredients like fragrance and Benzyl Benzoate. Buyers who wish for a pocket-friendly oil would not opt for this product. However, a feature such as its care to the sensitive skin has made buyers overlook the price tag. It is used mostly by men for their beards. For best results, you can coat the beard with the oil and gently glide a blade through. Truefitt is a highly natural product. It comprises of sunflower seed oil, tangerine peel oil, avocado oil and grapefruit peel oil among other essential oils. It is a product used mainly by men with heavy beards and sensitive skin. It provides an extra layer of protection that ensures a smooth, clean shave. Nobody likes the hustle of washing off oil after a shave. The great news is the oil rinses off quite easily. It also has an attractive manly scent. The product increases comfort by eliminating razor bumps. Aside from the convenience, ease of a razor gliding, and smell, it also does not clog the pores or the blades. Shaveology is a family owned business, where they strive to produce what is best for buyers. Premium Lubricating pre-shave oil comprises of sunflower oil, avocado oil, jojoba oil, walnut oil, and, Caprylyl Glycol Triglyceryl. All these components are natural and great for the skin. The natural oils keep the skin soft and rejuvenated. The shave oil is perfect for beginners in the shaving business. immediately it is opened, the product dispenses a strong smell. In spite of this factor, users only require a small amount at a time which allows the smell to fade away. If you are looking to have a great shaving experience, this is the product for you. The main selling point of this product is its conditioning feature. Various buyers hold it in high regard as it does not irritate the skin and retains moisture. Its ingredients are avocado oil, vitamin E, fragrance and apricot oil. Most of these ingredients are natural and safe for the skin. The only unnatural element is the fragrance. Buyers can use the product for a very long time without it running out abruptly.it is smooth and allows the razors to glide with ease. 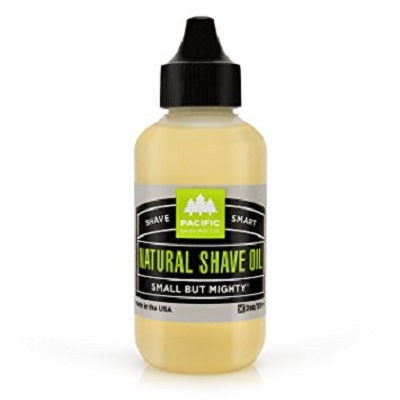 If you are looking for a natural product with a gentle touch of fragrance, this is the best pre shave oil for you. Note: This particular product is currently unavailable. Check out other options below or take a look at this wonderful alternative from Lather & Wood Shaving Co. that has an all-natural formula suitable for sensitive skin as well. The vintage-packaged, pre-shave oil has been in the market since time immemorial. Its ingredients include citral, fragrance, and Isomethyl Ionone. Most buyers would opt for a more natural option. If you are a buyer with severe skin sensitivity, this is not the product for you. The product is not fairly priced considering the small size of the bottle. This oil has a subtle scent of cloves. This feature has attracted numerous users over time. The product is highly viscous, gentle to the skin, and lasts for a long time. 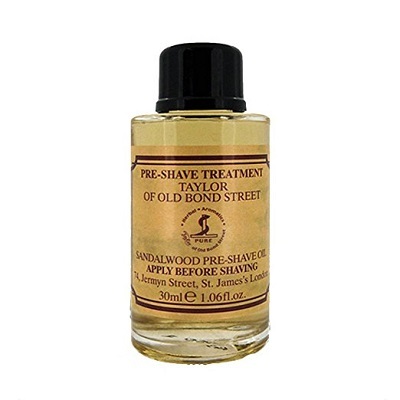 Taylor of Old Bond Street is the best pre shave oil for beginners and as a gift. The Pacific Shaving Company produces one of the best pre shave oils with 100% natural ingredients and completely animal-friendly. A few of the constituents are avocado oil, grapefruit peel oil, sunflower seed oil, bergamot fruit oil and vitamin E. Users shaving with a cartridge blade or a double edge razor experience the slickest feel. The oil is relatively expensive going for roughly $14 per ounce. Pacific shaving oil is neither too thick nor too thin, with just the right amount of viscosity. 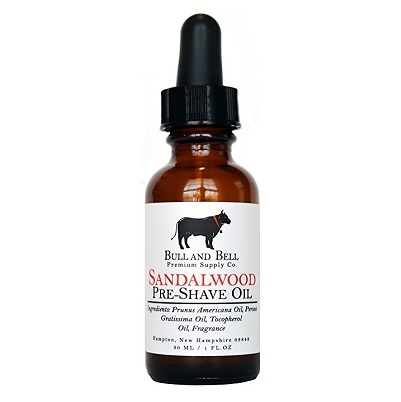 If you are shaving for the first time or you are curious to try something new, this is the pre-shave oil for you. 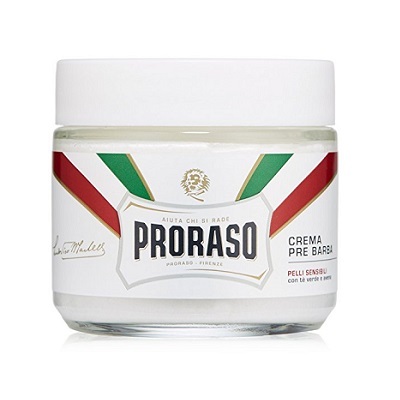 Proraso is the best pre shave oil when it comes to its ingredients. Some of the ingredients used include water, Stearic Acids, Sorbitol, glycerin, fragrance, and oats just to mention a few. The catch is that Proraso does not have Isopropyl Myristate, which usually clogs the pores. The oats in the cream are a natural exfoliator and moisturizer. The disadvantage to this oil is the chemical content which is on the higher side. On the better side, the product does not clog your blade, and your skin is left moisturized and smooth. Anyone with super sensitive skin can use this product. The product is suited for both beginners and experts. Note: If you have high skin sensitivity and are looking for a solution, we recommend reading our article on the best shaving gels for sensitive skin. 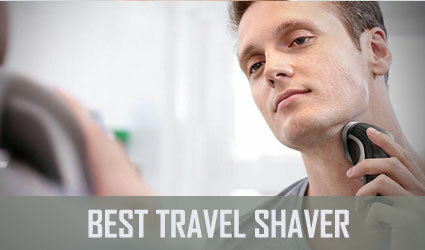 The Art of Shaving is the second best pre shave oil on this list. Its most desirable feature is that it is purely natural and unscented. The oil constitutes castor oil and olive oil. It is thus thicker compared to its counterparts in the industry. This higher viscosity still guarantees a comfortable shave with a smooth feel. Users apply a small amount while cutting to avoid clogging between the blades. The minimal application allows the product to last longer. As much as the pricing is on the higher side, the art of shaving still ranks highly among the best pre shave oils. It is an excellent choice for beginners or anyone who wants to try something new. 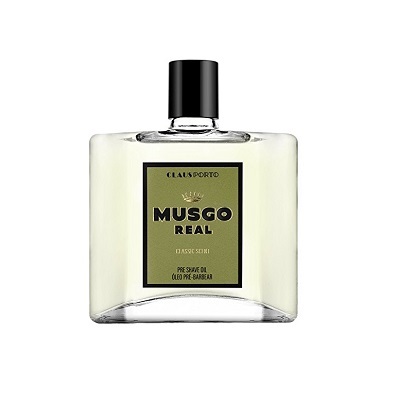 Musgo Real pre-shave oil derives its name from the Portuguese Musgo. It consists of sweet almond, grape, leaf juice, spearmint, tea tree, and peppermint. 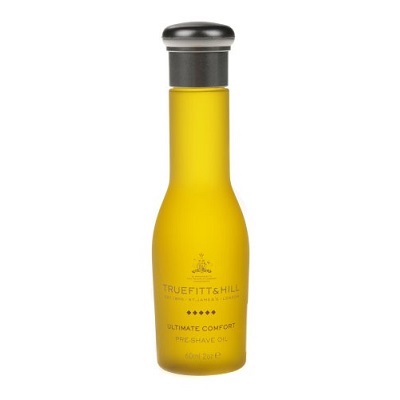 The oil is in an attractive premium glass bottle. It is a thinner oil compared to most pre-shave oils. This factor prevents clogging on razor blades. It lubricates the skin, prevents razor bumps and skin rashes. If you are fighting with stubborn hair, this is the oil for you. The product is well suited for shaving beards. Any other people looking to reduce unwanted hair can use it. Shaving can be an amazing experience if you have the right pre-shave oils, and according to online ratings and reviews, the best pre shave oil seems to be the Musgo one. However, the Art of Shaving and Proraso also make reliable products. Do you have other suggestions that were not included in this top?